We travel with our daughter. A lot. Over the months, I've perfected how to pack for her in the most efficient way. It's taken some trial and error, and sometimes I don't even follow my own directions because I'm trying to save a teeny bit of room in our bag. But I ALWAYS regret not doing it just like this. 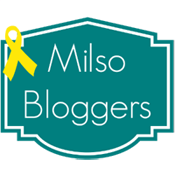 I'm here today to show you what I do - and really, it's so simple I shouldn't even be writing a blog post about it... but if I were new to traveling with a baby, I'd want to read this! My little traveler herself! This is during our recent PCS (military move) across the country. I'm so glad she sleeps well in her Pack n Play, and aren't her little dino sheets the cutest?! I start out by figuring out how many days we'll be away from home. 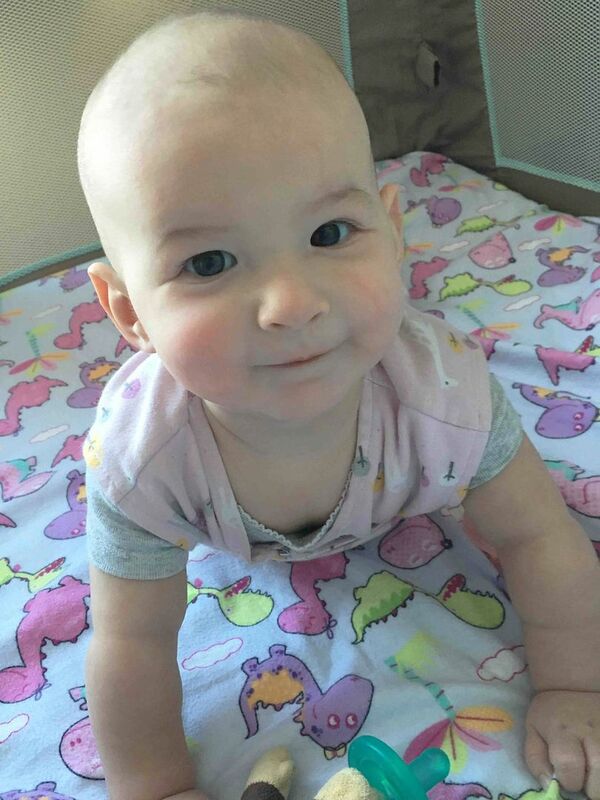 Normally we have access to laundry somewhere on our trip, but for our PCS, I didn't want to chance it, so I packed enough outfits for as many days as we'd be gone - plus a couple because, well, babies. 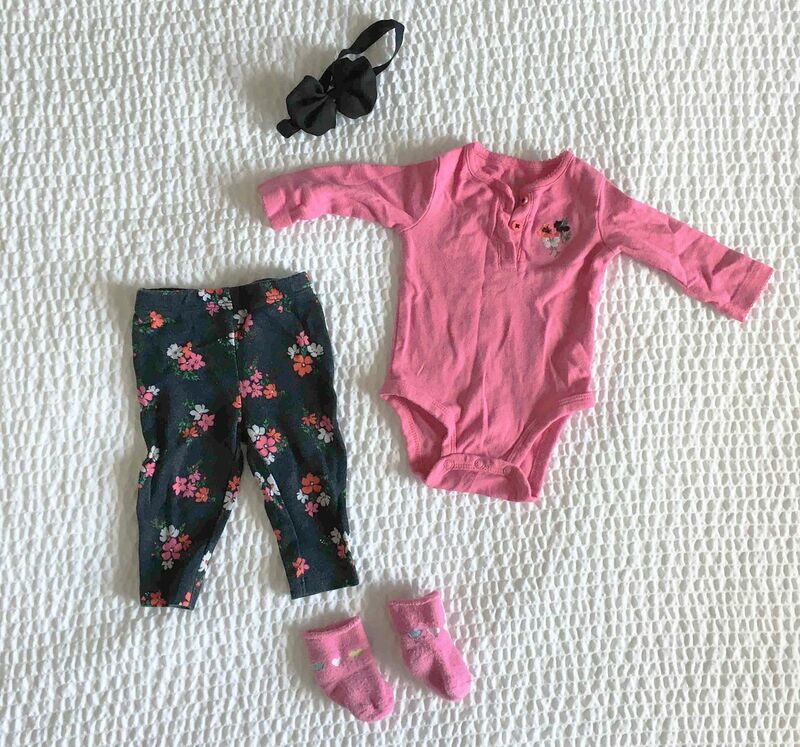 Her pajamas (just the little footie sleepers so far) are not pictured, but I keep them all together and just pull one out when needed. She usually sleeps in the same one two nights in a row when we travel. I lay out every outfit for the trip, and then I add matching socks/shoes when necessary and a matching bow for each outfit. The goal here is to do the work up front so it's easy peasy lemon squeezy when you're actually on the road. This way, I'm not spending precious time digging through all of her stuff to coordinate pieces, and she can still wear her adorable outfits. 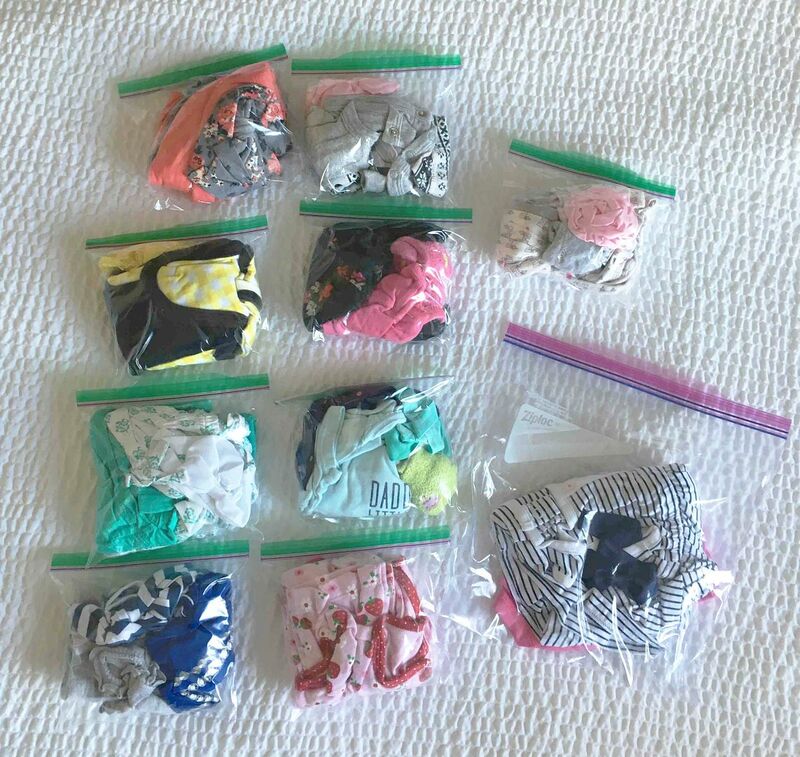 Then, I fold or roll everything up into a small Ziploc baggie. I was able to fit entire outfits in these bags until she surpassed the 3+ month clothing. Then, I simply started using bigger bags. 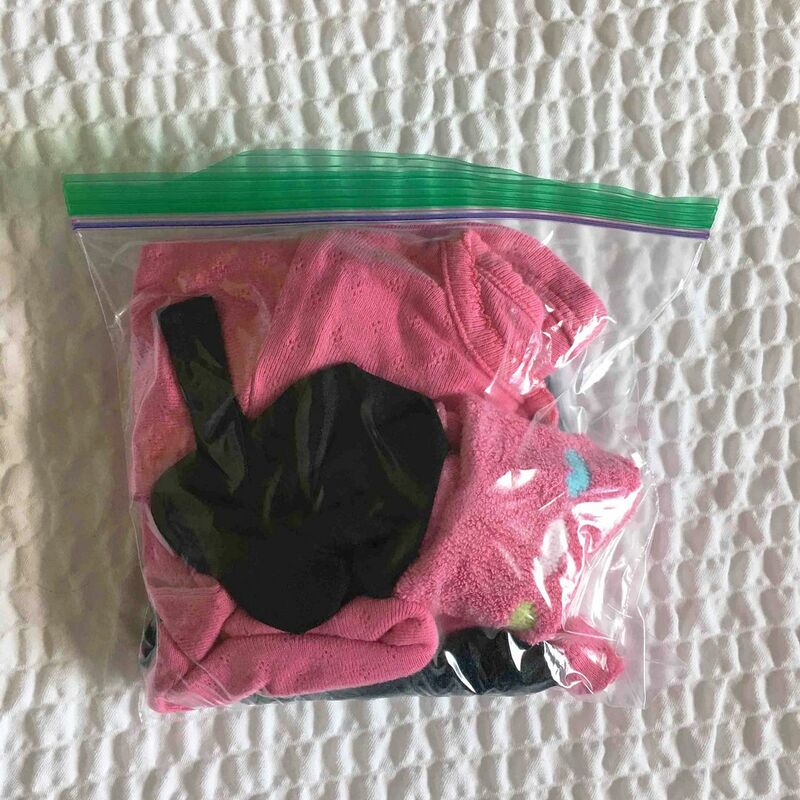 While we are away, whether in a hotel or at a friend/family member's home, I can spend less time figuring out what Annabelle will wear by simply grabbing a Ziploc baggie out of our suitcase. It's so easy, and it allows Dan to dress her as well without throwing together a bunch of mismatched pieces. This is what I include in one bag - enough for an entire outfit. *As a side note, I will say that we also go through a bib and burp cloth every day, but those don't fit in with the outfits if using small bags. 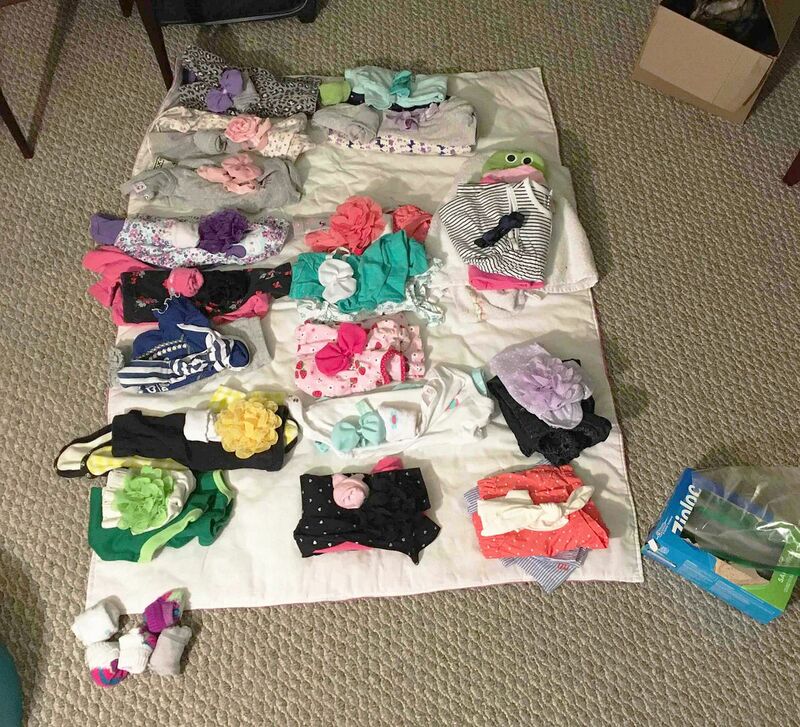 To combat that, I also pack a Ziploc baggie of bibs and burp cloths, and each morning, I am able to just grab one of each item to place in the diaper bag so they are fresh. This may seem a little silly and wasteful to some, but we re-use the baggies for sure. You can save them for your next trip, use them for whatever else you want/need (even food! ), or use them as makeshift wet bags in your diaper bag when there's an accidental diaper explosion.